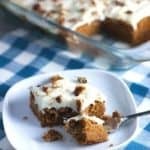 This delicious and easy to make cake will serve a crowd of hungry pumpkin eaters! Combine brown sugar, pumpkin and eggs in a mixer bowl until well combined. Add flour, baking powder, baking soda and pumpkin pie spice. Mix well. Bake for approximately 40 minutes or until center of cake springs back easily when touched. Cool completely before frosting. To make your own frosting: Cream together cream cheese and butter. Add remaining ingredients. Spread onto cooled cake. Top with chopped pecans.